Last year, my son started playing Little League at age 8. As someone who played a lot of sandlot as a kid, it was a happy surprise for me. Though like any good dad I had purchased a glove for him and his sister (when she was younger), and periodically took them out for catches, they were usually ready to pack it in after about five minutes. But in the summer of 2013, while playing catch with him one day, I noticed he suddenly had an arm. Later that fall, out of left field (ha ha), he told me he wanted to try Little League that spring. Unsure of how serious he was since he hadn’t ever really played the game (nor did he watch it), I put off paying registration as long as I could. Fortunately, right before the deadline, our local high school held a series of clinics for kids. I bought him some cleats and, the night before the first clinic, bought him a bat and tossed him some pitches for his first batting lessons. After the first clinic, when I asked how he liked it, he said enthusiastically, “It was great!” So it was on! Given he came from nothing (versus some of his teammates who started as young as 4 or younger), it’s not with a little bit of pride that I say that the kid turned out to be a bit of a natural. His coaches this year and last have called him a “coach’s dream”—he’s focused, he listens, plays smart (he learned the importance of coverage early on), and makes adjustments based on the feedback he gets. Both seasons, he’s been a dependable utility player since the coaches knew they could put him anywhere and depend on him. He’s also a bit of a playmaker—as catcher, he’s thrown out runners trying to steal second and third (the only one to do that on his team), and he’s made several plays at the plate on his own and in concert with teammates; he’s fielded tough ground balls at third (making an accurate long throw); and as centerfielder made a few catches, including one on a dive. His pitching is a work in progress, but he did hold a team to no runs one inning due to great defense by him and his team. While he needs to be more aggressive at the plate, he actually has a batting average of over .400 (he gets walked a lot, which says much about his discipline at the plate) and an on base percentage (OBP) of .500! A little over a week ago, my son’s Little League team—the Minor Yankees—clinched first place for the regular season with one game still remaining, earning a bye the first round of the playoffs. Believe me, all the teams look solid and the game results show that nearly every team can beat another on any given day. Having said that, my son’s team earned first place in the standings pretty handily, with a 12-3 record for a winning percentage of .800. The second place team managed 9 wins and a .695 winning percentage. 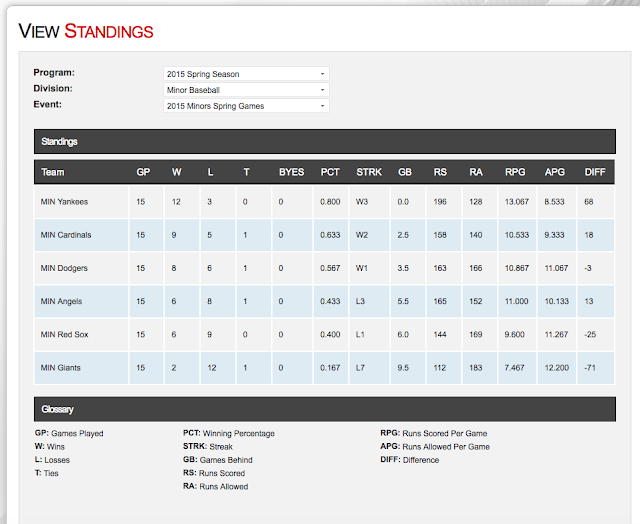 But it's now a clean slate as they head into playoffs and all teams have really improved their play over the season. What’s been amazing in the last games of the season, however, is how solid the team has become defensively—the kids executed great plays in the infield, and no one in the outfield let a ball get past them and got it back into the infield quickly—meaning that nearly all hard hit balls that went into the outfield were kept to only a single. That’s quite impressive at this level of play. Along the way, I also re-discovered my love of baseball. While I played a lot of sandlot baseball (and football) as a kid, and a bit with friends after college, I’ve never watched a lot of sports. Watching my son play—and realizing that watching a lot of baseball growing up helped improve my play, I’ve gotten back into baseball. I help out quite a bit in practices, always ready with cleats and my glove, and it’s fun to know I still play pretty well (though I certainly feel it more afterwards) and know enough to be able to help coach the kids. As I draw in the evenings, I often have the Major League Baseball network on in the background. Though I certainly feel I grew up during a great time to be a baseball fan (I lived in New York in the ‘70s when the Yanks fielded the likes of Reggie Jackson and Thurmon Munson), I’m amazed at the athleticism of today’s players—given the amount of money players today are paid, I’m sure their training and modern sports science have upped the skill level. Anyway, it certainly has been a great bonding experience for my son and me. Below are additional shots of my son in action, scroll down. For additional pics, see Little League Gallery 1 and Gallery 2. Cartoonist Randy Reynaldo, writer-artist of the long-running indy comic-book Rob Hanes Adventures, announced that the next issue of the globetrotting adventure series will be a “zero issue” that brings the character back to its roots and serves as a fresh entry point for new readers. 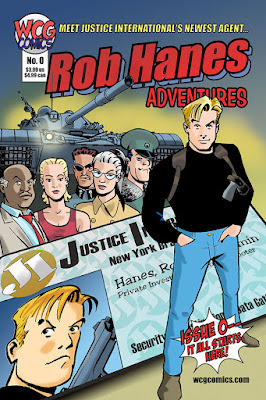 Rob Hanes Adventures #0 is slated for release in summer 2015, with a specific release date to be announced. The new stories will reveal Rob’s family background, the events that led to his joining Justice International (or JI), some of his early challenges as a JI agent, and re-introduce some key characters, including villains and love interests. Rob Hanes Adventures follows the exploits of a young globetrotting adventurer and troubleshooter who works for worldwide Justice International, a private investigation, security and mercenary agency. Set in the modern day, the long-running indie series follows in the tradition of classic adventure comic strips like Milton Caniff's Terry and the Pirates and Roy Crane's Buz Sawyer — with dashes of light-hearted humor reminiscent of Will Eisner's Spirit. Reynaldo added that there is a strong possibility that issue 0 would be followed by issue ½ and, perhaps, issue ¾, to cover stories he wants to tell that fill in the gaps from the character’s early days as a private investigator and globetrotting troubleshooter. Reynaldo stressed, however, that this is not a complete “re-boot”—the series will eventually resume its regular numbering and all prior continuity, for the most part, remains in place. Nevertheless, Reynaldo said that some of the early stories and characters may be slightly tweaked in what he describes to be a “soft” re-boot. All issues of Rob Hanes Adventures are self-contained, so readers always have the ability to jump in with any issue. However, Reynaldo recognizes that some people seeing an “issue 15” on the cover might feel a bit reluctant to try out a new series and hopes the planned “issue 0” will appeal to new readers. To date, 15 issues of Rob Hanes Adventures and two trade paperback collections of earlier work—Rob Hanes Adventures, Vol. 0 and the Rob Hanes Archives—have been released and remain in print. Over its run, Rob Hanes Adventures has been reviewed, spotlighted and featured in numerous respected comics industry news publications and websites, including the Comics Buyer’s Guide, Newsarama, Comic Book Resources, and Bleeding Cool. The series also was featured at wired.com and included in 1000 Comic Books You Must Read by Tony Isabella (Krause Publications, 2009). The year 2014 marked WCG’s twentieth anniversary as a comic-book publisher. For more information, visit wcgcomics.com or facebook.com/rhadventures.